About a year after shovels hit the ground, doors at a new North Point Douglas affordable housing building are officially open. The Austin Family Commons opened on Friday. Construction on the three-storey, 19-unit affordable housing complex began in January 2016. Architect Hijab Mitra said the project was focused on empowering the community. "It was just a project where people just had hope for the community, and wanted to change the perception of what the community is and wanted to beautify their community," Mitra said. Ten per cent of all labour hours on the project were provided by social enterprise employees, and Mitra said people living in the area were consulted on the design and colour of the house. "I think architecture has a lot of power to change communities, and what we are trying to do is use architecture as a tool to create hope and healing within communities, so communities have memories together," he said. 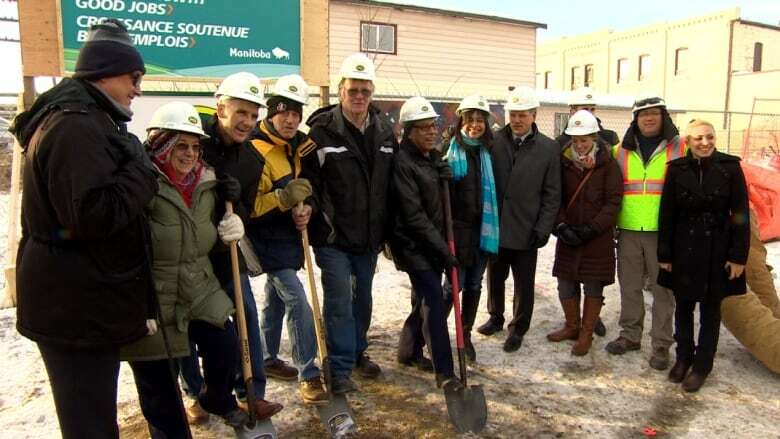 Manitoba Housing paid for the construction of the $7.5 million complex, which is located at 150 Austin St. North. According to a provincial press release, all rents will be set at affordable housing levels and half of the units are intended to be available on a rent-geared-to-income basis. "Austin Family Commons will become part of the fabric of this community while ensuring more families have access to affordable and welcoming homes," said Families Minister Scott Fielding in the release. The building features mostly three- and four-bedroom units, two of which are fully accessible. Tenants will be selected by the Winnipeg Housing Rehabilitation Corporation (WHRC), which was selected as the non-profit manager of the property following a competitive request for proposal process, the province said.